Happy Wordless Wednesday! For all you lovebirds out there, imagine your toes in the warm sand at Zoëtry Agua Punta Cana, sharing a fabulous, romantic dinner with your special someone. Breathtaking, isn’t it? 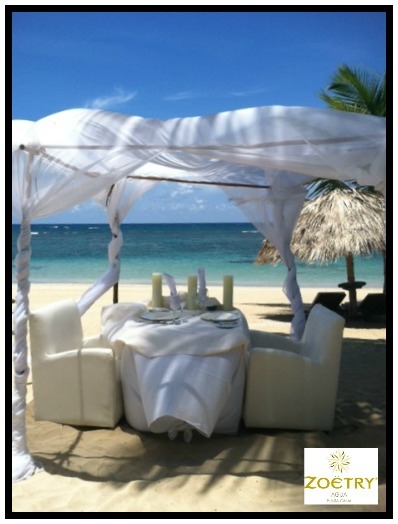 Plan your getaway to Zoëtry Agua today and reserve your magical beach front dining experience! This entry was posted in Zoëtry Agua Punta Cana, Zoëtry Wellness & Spa Resorts and tagged gourmet dining, luxury, romantic dinner, Wordless Wednesday, Zoëtry Agua Punta Cana, Zoetry Agua. Bookmark the permalink. ← Pin It to Win It with The Knot!